This is just a reminder for everyone in Johannesburg that we will be screening DocLove JHB 02- American Foulbrood by Carlos Francisco tomorrow night at the Bioscope at Life on main. Please come out and show your support for this DFA members film and for the Doclove initiative. The film is by our longstanding member Carlos Francisco who started on a bursary as an aspiring docy filmmaker and has now produced and directed a serious masterpiece in my opinion. The last DocLove was a serious disappointment concerning DFA member turnout, as not a single DFA member came and we still had 70 people at the screening despite it being rained out. I urge all DFA members in the Johannesburg area to come through and show your support. If the Bioscope always brings the crowd and no DFA members who have free entry don't show they will eventually figure they can do it without us and that would be rather sad. DocLove is an important initiative to promote the genre of documentary in South Africa and should really be supported by all members. Remember that you will all benefit from it in the long term, as more South African get switched on to the beauty of Documentary filmmaking and even gain insight into how they are made and get to engage with the filmmakers. At a time when globally bee populations are dramatically collapsing, African bees show no signs of being affected, they are flourishing. Early 2009 witnesses the unexpected and sudden outbreak of ‘American Foulbrood’ this, the world’s worst bee disease and historically prevalent in all countries, has finally arrived in South Africa. 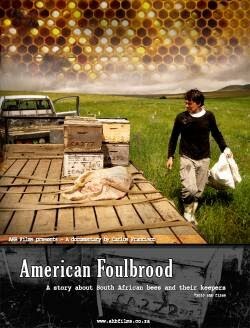 Filmed over a period of a year we follow some charismatic South African beekeepers as they come to terms with and react to this, the worst of all bee diseases. The wild South African bees have handled every disease thrown at them before, how will they do this time with the worst bee disease known. The viewer is taken on several personal journeys into learning the secrets behind the African bee which until now has been unaffected by the rest of the worlds problems. The film brings forward the dilemmas people are faced with when livestock fall prey to diseases. Is it time for man's attitude to control everything to be reconsidered? The story brings about a comparison between the practice of keeping wild bees in South Africa as to the mass breeding and artificial insemination techniques of America and Europe. The film and its characters raise the question, is it not perhaps time to turn to nature for the answers? Will all the world's disease finally put the African bee in the same situation as the rest of the world or can she pull through one more time. And we’ve a message for the media too! For a fresh critical perspective come to our children’s press conference! One day into the World Cup, children from two local schools (Naturena Primary and Saxonwold Primary) are going to be giving their verdict on Bafana Bafana’s first performance, and letting you know how they feel about the big stories hitting the headlines. Come and hear their calls for change, and their views on what we can do better! The Encounters - South African International Documentary Festival are calling on documentary enthusiasts to volunteer for the 2010 Festival. Encounters is a well-established film festival, which showcases local and international documentaries and runs various workshops, panels and master classes. This opportunity is open to all people regardless of experience but the following criteria would be an advantage: Communication skills; Computer Literacy; Technical skills; Writing skills; Own car and Cellphone and Film Industry Experience. If you are interested, send a 1 page CV with contact information to Nazeer at reception@encounters.co.za by Friday 25th June 2010. Some candidates can be appointed immediately.